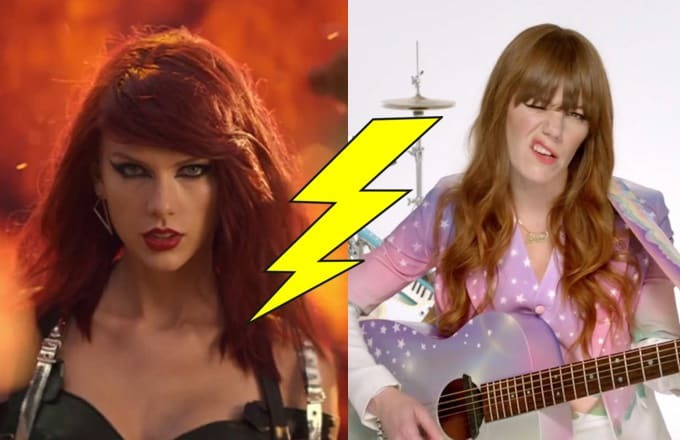 Jenny Lewis and Taylor Swift both love showing off their entourages of famous friends. Taylor, admittedly, is flashier about it than Jenny Lewis is, though having Anne Hathaway, Kristen Stewart, and Brie Larson star in your video is no humble-brag either. Lewis, previously of the band Rilo Kiley, is an indie band darling-turned-solo star, with a strong following that trickles over from her late-&apos;90s/early aughts era. And Taylor Swift—well, that girl needs no introduction. Neither do either of their friends. Last week, when Taylor Swift dropped her much-hyped, highly anticipated "Bad Blood" video at the Billboard Music Awards, she took flashy to the point of gaudy. Aside from Kendrick Lamar (who lends verses on the track), the video is a hodgepodge of everyone you&apos;d recruit for your dream girl gang. Selena Gomez! Cara Delevingne! Karlie Kloss! Jessica Alba! Lena Dunham! Even Mariska Hargitay and Ellen Pompeo. And, whoa, godmother of supermodels, Cindy Crawford, too. The star power here is bonkers. But if "Bad Blood" leaves a bad taste in your mouth, it&apos;s not just because the video was a mindless shitshow of a show-and-tell. It&apos;s the pettiness of the backstory, which revolves around her beef with Katy Perry. At this point, I don&apos;t even know why they started fighting, but if it is really about John Mayer, then oh my gosh I want to tune out completely. That&apos;s surely not the full story, though: Google "Taylor Swift Katy Perry" and the feud theories and revenge schemes abound. Taylor, you&apos;re supposed to be our shining beacon of girl power, not our garish symbol of girl-on-girl hate! Jenny Lewis, on the other hand, uses her celebrity posse for greater good. In her newest video, "She&apos;s Not Me," the indie singer-songwriter calls on her buds Fred Armisen, Vanessa Bayer, Zosia Mamet, Feist, and Leo Fitzpatrick in a kooky parody video of old TV shows. If you know Jenny Lewis&apos; past as a child star, then you&apos;d know she&apos;s poking fun at herself. In the &apos;80s and &apos;90s, Lewis played small roles in Golden Girls, Troop Beverly Hills, Growing Pains and many more. No beef, no (IRL) drama, just a self-deprecating lol. Instead of the "us-versus-you" stance Swift puts on, Lewis invites us to a "laugh with us, at us" kind of sentiment. Perhaps a better comparison to Taylor&apos;s "Bad Blood" is the aforementioned star-studded Jenny Lewis video, "Just One of the Guys." Featuring a different kind of dream girl gang (Hathaway, Stewart, Larson, and Tennessee Thomas)—in drag!—the video touches on gender identity in a charming, light-hearted way. For me, it&apos;s one of the more relatable views of the Daily Struggles of a Woman—for Lewis, it&apos;s the societal pressures of being single and childless at her age. Lewis has told UPROXX that she considers herself a feminist: "I think that if we all try to practice these things in our own lives, that’s the most important thing: extending ourselves to other women, giving other women opportunities, allowing ourselves to be successful and challenged and not being afraid to tackle difficult things in the work place. So yeah, I am, of course a feminist." Ditch the "you can&apos;t sit with us" mentality of Swift and opt for Lewis&apos; brand of "We feel you." Let&apos;s just hope Lewis and Swift sharing an ex doesn&apos;t ignite a "Bad Blood" sequel. 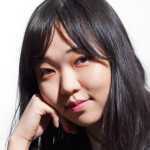 Kristen Kim is a staff writer for Complex. Follow her @kristenyoonsoo. Quiz: Is This a Drake or Taylor Swift Lyric?